You're right but also wrong. The underlying Bitcoin will always be there but it's unsure if it's going to $100k or $0 tomorrow. There are arguments for both. But if it does either, the margin call will bankrupt the trading houses. Interactive Brokers will only allow long trades! How is that possible? And the scary thing is that he's rich enough and smart enough to sink it by himself. He pioneered high speed trading. And I agree with him. You don't want this level of volatility in a futures market. The regulators dropped the ball. But why does he constantly call this a bubble yet only allow customers to go long? With the news that Steam will no longer take Bitcoin, Bitcoin went up. That's crazy. There's something going on here. For this thing to spike so high right before its open in futures... Maybe not a coincidence. I can't imagine a better Wall Street dream. They have a product that can't be used, can't be forged, doesn't even exist, and they get to gamble on where they think it will go. Somebody knows what they are doing. I wish I knew if it was being pushed up or down. Anybody else wondering if it's the weapon to bankrupt your investing competitors? I'm doing my best to figure it out but it's real hard to get data on these houses. If I see something, I'll post it. I think that BTC and other crypto mediums are simply today's PET ROCK and while a form may survive...isn't this the 'easily manipulated and controled' form of exchange that we all have been warned to avoid? ...isn't this the 'easily manipulated and controled' form of exchange that we all have been warned to avoid? No, I think you’re confusing BTC with USD. Last night and this morning I listened to Jack's crypto currency episode. I don't regularly listen to every new show, but will spot download topics of interest. Crypto currency infrastructure will be where the steady growth lies. This was true during the 1849 California gold rush. Levi Strauss made more selling denim overalls than anyone mining for gold. I also think of what Apple/iTunes did for mp3 and digital music. I had mp3s in the late 1990s, but it was for computer geeks. The technology was mostly there, but apple wrapped it up into a simple attractive package, so even the simplest of users could use it. Someone will do similar for crypto and become a billionaire. Pieces are coming together. 40% of Bitcoin is Japanese buyers. Japan is arguably the largest country for forex trading because the Yen has a negative interest rate. These are short term, get rich quick traders. I should point out that Japanese banks offer some of the highest leverage. And wouldn't you know they let "investors" leverage Bitcoin. So the futures quants in NYC are looking at this and realizing almost half of the Bitcoin rally is leveraged Japanese accounts. And they know the dirty little secret. Leveraged accounts can't afford to lose money. It turns out the rally isn't the true believers but an Asian forex trade. I think we've done some damage coming up with the "hoddlers" slur. They're not driving the market at all. Lots of moving pieces here. I'm trying my best to put it together. When I get something, I will share it post haste. I think we've done some damage coming up with the "hoddlers" slur. 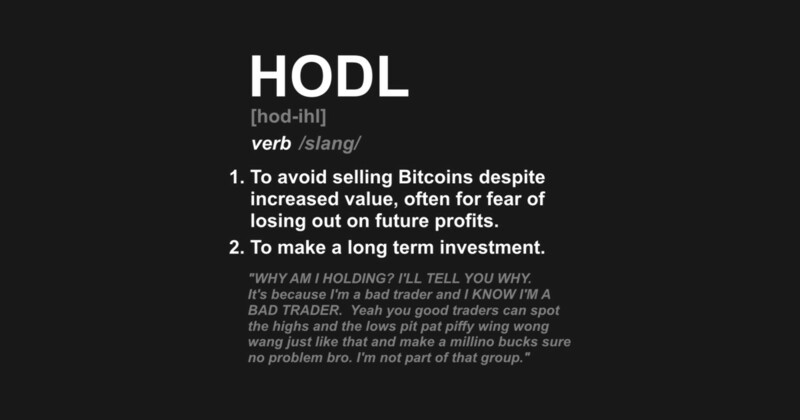 It's not a slur, Hodlers wear it with pride. It's not a joke to me. I intentionally avoid slurs in the economic realm. I try to provide the most up to date data and I get glib from a mod. I'm done. Do your own math. You know what is surprisingly complex, is setting up automatic dollar-cost-averaging for anything other than BTC. I have coinbase setup to take $50 each payday, but they only have options to buy BTC on recurring. Last I checked there's not an integrated "shapeshift" in coinbase either. So I've started using jaxx for my main wallets, and coinbase is just the integration to my USD bank account(s). In Jaxx I can swap between almost any alt-coin out there. My current strategy is to gradually accumulate LiteCoin and Dash. I was discussing with a co-worker who recently moved to the US from Serbia on a work visa. He is younger, but having lived through multiple Balkan conflicts, and schizophrenic foreign policies - he is a fascinating contrarian investor to talk with. He is way more bullish on crypto than I am, but he is also practical. He said BTC is like gold. You don't buy dinner or pay your bills with it. It sits in the safe until you need to make a major purchase. So to him the slow mining and high fees are tolerable in that context. It's like liquidating a gold bar or old time paper stock certificate. We both agree whichever consumer level coin gets widely adopted will be a sound investment long term. Maybe it'll take a national fastfood chain or other retailer, but already the legal cannibis shops up here are beginning to integrate with DSH. If the pot shops can make DSH work, Amazon and Wal-Mart eventually could too. He said BTC is like gold. You don't buy dinner or pay your bills with it. It sits in the safe until you need to make a major purchase. So to him the slow mining and high fees are tolerable in that context. It's like liquidating a gold bar or old time paper stock certificate. Personally I think the term "accumulate" is more appropriate. Similar as you would with a bluechip stock. But even stock holders of old school industrial giants should have an exit strategy. The lack of this among many of the BTC "horders" detracts from their credibility in some circles. Given it took me over 24 hours to "shapeshift" about $50USD worth of BTC into DSH, I'm only using BTC when I must. But even stock holders of old school industrial giants should have an exit strategy. The lack of this among many of the BTC "horders" detracts from their credibility in some circles. Pretty much all circles, really. A recent survey showed an average target sell price of just under $200k/bitcoin. Even for a bitcoin maximalist like myself, that’s absolutely mind blowing. Of course that completely neglects all kinds of market drivers, but it does put some kind of quantitative perspective on it. Maybe another way to look at it is there's likely only about 10x upside left to bitcoin. Normally a 10x upside is pretty good, but there's also a pretty steep downside possible too. I'm definitely not an expert here! I'll just say that any investments with potential down sides that are more conveniently expressed on a log scale are too hot for me. The BTC price rose overnight and is currently trading above one pound of gold. I've probably wasted a day of my life research crypto mining hardware, it's costs, throughput and capabilities. There are MANY problems with getting into mining, and I mean real mining that produces > $100USD monthly. Not spending $0.25 of electricity so you iPad poops out $0.05 in crypto. Based on all that, I feel DSH is perhaps the smartest kid in summer school here. But even if I could find a Miner for sale on amazon, I'm not confident the valuation would not decrease before the miner paid for itself. You also have the broader problem of paying yourself in the thing you're producing. If you grow tons of tomatoes, you probably need to convert some to cash to pay the rent. Great, you mined 5 coins! Do you exit into USD, preserving the bulk of the value (ignore inflation for now), but exposing yourself to capital gains taxes? What's the point of tooling up to "beat the house" if all you can ever do with your winnings is place larger bets? I've heard mining compared to being a land lord, where the property owner starts with a single unit, saves profits, invests in a second unit, etc. Soon the property owner is buying whole apartment complexes, has a good CPA and does crafty, but legal, tricks to leverage tax rules. While the re-investment portion may be possible with crypto, there needs to be some smart business acumen to bridge back to the fiat/gov world. Anyone who's followed Robert Kiyosaki, will know what I mean. Mining has always seemed to me like a much bigger risk than just buying the crypto from someone else and riding the appreciation wave. Coinbase just released BCH equivalent to the amount of BTC held on August 1, but the price is crazy high and sales are disabled. U.S. regulators temporarily suspended trading in an obscure digital currency company due to concerns that its stock is being manipulated after the shares surged more than 17,000 percent in less than three months, making paper billionaires out of top executives. My son was doing cartwheels when I came through the door tonight. Apparently a few months of his allowance in BTC had turned into a few hundred in BCH. Well that has since fallen to 1/4 that amount, and unable to sell we just watched helplessly. To a 13 year old, he just witness a new Xbox being thrown into the ocean. ... The company is the product of a reverse merger with a sports bra company. Yeah, with the price at $8500, I was maniacally pounding on my mouse like a crack addicted monkey. I don't disagree with any of his points, but I don't know how well it corresponds with Taleb's conception, although a quick google search reveals recent positive comments from him about BTC. Am I the only one worried about tax implications? I'm not a CPA or tax professional, but I know enough to postpone large capital gains of equities until the new year. Do BTC and other alt-coin holders do similar? Can we expect a huge dump of BTC/BCH next month (Jan 2018)? Does anyone have the stones to create a stop-loss? Holding this stuff after making 10x gains is moronic. Sell when able and go buy an asset with that money like a real capitalist. This is why I traded my BTC to physical gold . Sounds like the ideal time to limit how much you could lose off the current price. Which is exactly what a stop-loss does. Seems like there's a lot of price flux, so unless you want to monitor the price every second a stop-loss is a good way to limit the downside risk. The ones who are fully in on cryptos will set up benchmarks and withdraw funds once those benchmarks are hit. They'll then take those earnings and invest them in emerging coins (Ripple was one popular option a few of my friends were discussing... I know that it has doubled in price in a short timeframe). I'm personally not in on crypto's at the moment because the wife and I are saving every penny for a new home (going to wait till the real estate market here in Illinois crashes as a result of tax reform... we have anywhere from 9-18 months to sock away as much as possible), but after we get everything all set up, we'll most likely start to dip our toes in crypto at that time. My hope is that the DoJ and SEC will have stuck their noses in a little further and legitimatized the exchanges a bit more by that point. Right now, I'd be terrified that my wallet was going to get breeched as I slept, and the lack of FDIC insurance makes that a potentially devastating loss. For me (and I'm certainly not speaking for anyone else)... I don't want to take 5% of my retirement portfolio and put it into what is essentially a casino right now. I'd rather take the money and put it into savings for the down payment on a home in what should, hopefully, be a buyers market in the next 18 months as a result of tax reform putting the squeeze on existing homeowners who are going to be taxed out of dwellings. So your hope is more government with a little more government sprinkled on top. Please stay out of crypt-currency. The whole point by the way is that you should not be holding money in exchanges. If you want the safety of violence backed currency - stick with debtcoin.